For military use of the airport, see RAF Valley. 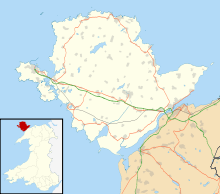 Anglesey Airport (Maes Awyr Môn) (IATA: VLY, ICAO: EGOV) is an airport owned by the Isle of Anglesey County Council on land leased from the Defence Infrastructure Organisation. The airport is situated at Llanfair yn Neubwll on the Isle of Anglesey, Wales. The leased site is part of RAF Valley, an RAF station teaching RAF pilots using BAE Hawks. Plans put forward in early 2006 by the National Assembly for Wales have led to a subsidised weekday air service between the airport and Cardiff Airport, 12 miles west of the Welsh capital in the hope of improving the economy of Anglesey and North Wales in general. The twice daily service began in May 2007. The passenger terminal is a single storey building consisting of a check-in desk, departure lounge and baggage handling areas as well as other visitor information areas. The terminal, completed in 2007, was designed by MAP architects and cost £1,000,000. The publicly funded building contract was given to the construction company Yorkon. The building was built off site and brought to the airport when finished. The airport's principal stakeholders are RAF Valley, The Senedd, the Isle of Anglesey County Council and Cardiff Airport. In March 2018, flights between Anglesey Airport and Cardiff Airport were suspended due to a Hawk aircraft from the Red Arrows crashing onto the runway. Domestic flights were being diverted to Hawarden Airport in Flintshire with coaches transporting passengers between Valley and Hawarden. On 13 March 2017 the service was taken over by Eastern Airways using a Jetstream 41 operating under the Flybe franchise. Welsh Government announced in February 2019 that it had awarded the new 4-year Public Services Obligation (PSO) air service contract to Eastern Airways. ^ Airport information for EGOV at World Aero Data. Data current as of October 2006.Source: DAFIF. ^ Airport information for EGOV at Great Circle Mapper. Source: DAFIF (effective October 2006). ^ "Fatal Red Arrows crash inquiry continues". BBC News. 21 March 2018. Retrieved 21 March 2018. ^ "Eastern Airways Flybe Franchise". Eastern Airways website. ^ "Welsh Government | Cardiff to Anglesey flights secured for another four years". gov.wales. Retrieved 18 February 2019. This page was last edited on 18 February 2019, at 12:00 (UTC).